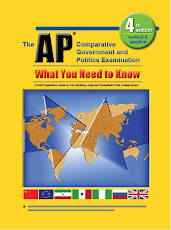 Beginning March 3, I'll post a question here about comparative government and politics each week day until May 1. And you'll win two What You Need to Know number two pencils to help you fill in the exam's multiple choice answer sheet. One of the pencils will have all the multiple choice answers on it and the other will contain King Arthur's memorable line from Monty Python and the Holy Grail, "You don't vote for kings!"